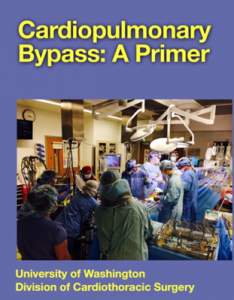 Cardiopulmonary Bypass: A Primer was created by surgeons, perfusionists, anesthesiologists, and nurses from the Division of Cardiothoracic Surgery at the University of Washington Medical Center in Seattle, WA. Through this interdisciplinary perspective; residents, medical students, perfusionists, nurses, anesthesiologists, and anyone else in the operating room may gain new insight into this distinguishing technology. Important Note: Cardiopulmonary Bypass: A Primer may only be viewed through the iBooks application from your iPhone or iPad. Download the iBooks application to your iPhone and/or iPad device here. This will open a link to iTunes to download the iBooks application.